JPMorgan Chase Bank is one of the “Big Four” banks in the United States, along with Wells Fargo, Citigroup and Bank of America. As of 2017, the company reports having 5,100 Chase Bank locations in 26 states, and $2.5 trillion in client assets. Chase serves nearly half of U.S. households. Consumers who want to bank with Chase but don’t have a convenient Chase Bank location might have access to internet banking services such as online banking, online bill pay and mobile banking.You can open a checking account or savings account online, or transfer money using Chase QuickPay. Click here to see Chase’s different deposit account options for everyone. By finding out how many locations Chase has in your state and looking up locations near you, you can determine whether this bank offers the convenience and level of service you require. Chase offers six major services, including investment and retirement planning, commercial banking, card services, treasury and securities services, asset and wealth management, and retail financial services, including consumer banking. For individuals and business consumers, Chase offers ATMs, bank branches, and express banking kiosks, which are large-screen kiosk locations that provide banking services without a teller. Kiosks can dispense cash in one-dollar denominations and issue permanent debit cards. Check Out: What Is Chase QuickPay and How Do You Transfer Money With It? Consumer banking branches offer a wide range of services, from setting up bank accounts to applying for home and auto loans. 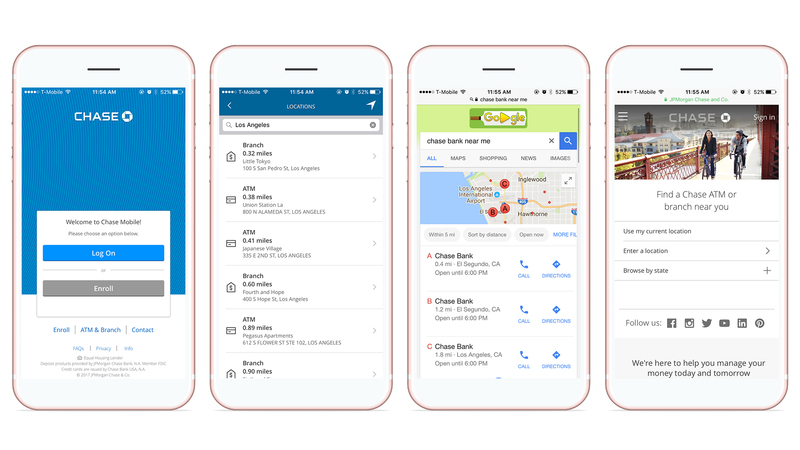 You can easily locate the nearest Chase bank to you by visiting the Chase locator website. Get started by entering a ZIP code, an address, or a city and state. If you are looking for private client services, which offers premium banking privileges and concierge banking, visit the branch locator at PrivateClient.Chase.com or call 888-994-5626. Chase Bank deposit accounts are FDIC insured for $250,000 per depositor. You might qualify for more coverage if you have a joint account with your spouse in addition to your own account. This means that the Federal Deposit Insurance Corp. insures the funds in your account, in the event your bank fails. If you’re searching for “Bank of America ATMs near me,” here are three easy ways to find them.